What the hay!!!. 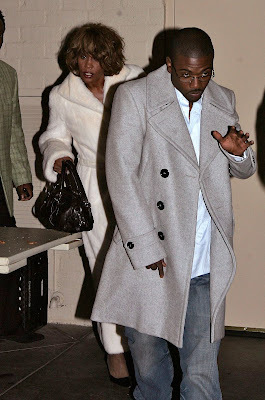 Whitney Creeping with Ray J . It makes me think, is she trying to make Bobby Brown feel some type of way because of the Karrine Stephen(a.k.a Super head) ordeal, or is Whitney trying to get her groove back. As for Ray J, it seem like Kim Kardashian was just to young. He wanted a mother figure i guess. Whitney looks like she's crazy spaced out, as if she's still hitting the pipe or something. Ray J better watch out, she might turn his young a$$ out!. You can check more on this story at Aggregated Blogs. There's also other bugged out pics of the two. Comments on "What The !!!. Whitney Houston and Ray J creeping"